David spent more than fifteen years as a journalist, including seven years as a crime reporter with the Yorkshire Post – walking the Hull streets that would later become the setting for the Detective Sergeant Aector McAvoy novels. He later worked at the Press Association in Howden, which drove him to commit (fictional) murder. He has written eight novels in the McAvoy series: the first of which, Dark Winter, has been turned into a sell-out stage play at Hull Truck Theatre, was a Richard & Judy pick and a Sunday Times bestseller. David has also written The Zealot’s Bones, a historical crime novel published under the name D.M. Mark. 2019 sees the release of McAvoy novel Cold Bones, and a standalone thriller set in the 1960s, The Mausoleum. 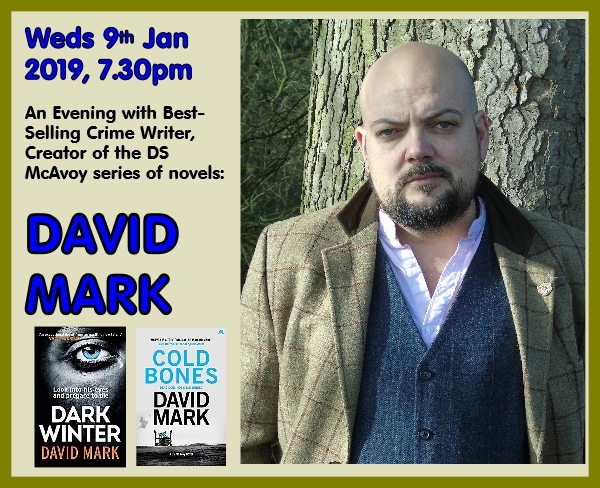 This will be an evening offering a fascinating insight into the mind of one of the UK’s leading contemporary crime-writers. Licensed bar. Through the generous sponsorship of Newbald WI, all profits from the evening will support Newbald Village Hall.